25 Feb Will the real Slim Shady please stand up? The best concerts to see this year! If you thought 2018 was a big year for live gigs then 2019 is big, big, big! This year us Perthians are treated to some simply mega concerts from some of the biggest artists in the world! Rap fans, rock fans, pop fans, you’re all spoilt this year! Legends, icons, chart toppers and more legends will all be gracing our wonderful West Coast shores bringing with them their own unique musical talents. Believe us, this one was hard to narrow down, but we’ve managed to keep it to 8 of the best concerts in Perth this year. The rap god himself plays next week in Perth to a sold-out crowd at Optus Stadium. The highest selling artist of the 2000’s, Eminem has got bangers on bangers. We’re sure to hear tunes from his latest album ‘Kamikaze’ as well as a long list of mega hits spanning almost two decades! Supported by Aussie hip hop heavyweights Hilltop Hoods and Eminem’s label mate Royce da 5’9, this will be a huge night. The hugely popular Los Angeles band make their long-awaited return to Perth bringing their energetic style performance to NIB stadium. Their staggering list of hits span twenty years, so you’ll definitely be on your feet, singing along throughout the night. Also known for their improv live performances, expect ad lib live versions of songs, stunning solos and an exciting, over-the-top vibe. Australia’s own pop princess brings her ‘Golden Tour’ all over the country, stopping by Perth for the ‘A day on the green’ outdoor concert. For the first time since 2015, Kylie jumps back on stage to perform hits from her latest album ‘Golden.’ The Aussie Icon is sure to dazzle with her breathtaking voice and captivating performances. The Irish icons were one of the most popular groups to emerge from the 90’s boy band era topping charts the world over. Their success stretched to Australia with many of their singles including; ‘Father and son’ and ‘No matter what’ becoming radio staples. Joined by special guest Brian McFadden, celebrate the release of their new album live from HBF stadium. After selling out their previous tour and playing at festivals all over Australia, the Aussie electronic duo come back to the west for their ‘Biggest Tour Ever.’ Well known for their epic live performances, expect nothing less than loud tunes in a fun filled, sweat fest. Get involved, this will be a party! A different line-up but the same spectacular songs, Fleetwood Mac return to Perth without Lindsey Buckingham but with quality additions Neil Finn and Mike Campbell. Starting their Aussie leg in Perth, the bands massive North American tour has seen them spend 7 months on the road. The Grammy award winners are likely to play all their big hits, but we should also be prepared for a few surprises. The rock and roll legends bring their final ever ‘End of the road’ world tour to the West Coast. The heavy rockers are known for their crazy iconic shows that have been the backbone of an epic career. Get loud and rowdy with these rock and roll hall of famers and experience the wild atmosphere only a KISS show can provide. The legend himself, live in the flesh! This will be the last time to see the great musician in Australia as he embarks on his ‘Farewell Yellow Brick Road Tour.’ The chance to see this superstar perform his long list of hits should not be missed. This will be one for the ages! 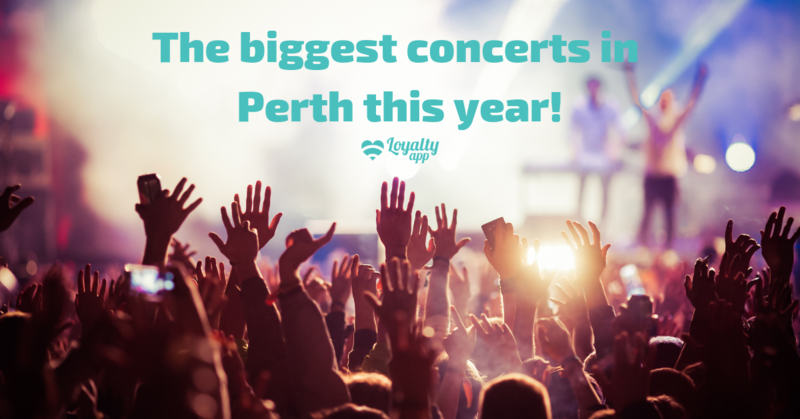 Whilst you’re attending any of these epic concerts, make sure you pop into one of our many amazing food merchants and receive exclusive Loyalty app dollars every time you dine. Download Loyalty app today from the App Store or Google Play and start earning and using your Loyalty app dollars at hundreds of WA’s best brands.